Well, school is in full swing right now and my daughter is experiencing a lot of “final” high school experiences. We already had our ‘final’ first day of school picture, and now we are headed into the fall season. A week ago she didn’t think that she would be going to homecoming this year. This weekend, all that changed. 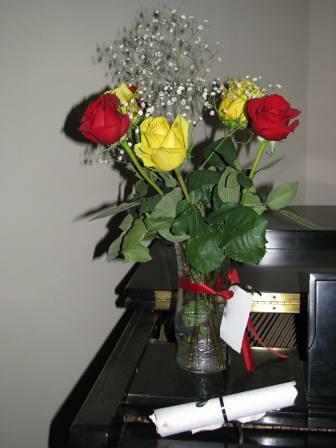 Mandy quickly noticed that the roses are the colors of Gryffindor House. 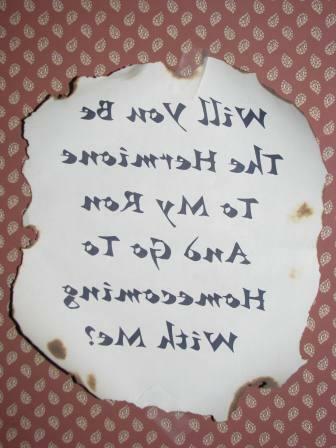 She opened the scroll – which looked like this. And go to Homecoming with me? Could prevent me from going to homecoming with you. Yes…this is a relationship based on Harry Potter and this bibliophile mother could not be more pleased that her youngest loves literature almost as much as she does! Mandy actually looks like Hermione and Jake is definitely Ron Weasley made over. There is even talk that they may attend the dance in character. If that is the case, you can be sure that I will post pictures. Oh my gosh, that is so sweet! I hope they have a blast at homecoming. How wonderful. What a sweet way of inviting someone. My kids are experiencing their final things of junior school this year as they go up to senior school next year. Scary stuff. How sweet is that? I'm hoping for pictures! Oh, my goodness — this is absolutely the coolest! I can't wait to see pictures!! Just adorable and so very creative! I hope they do go in character- I'd love to see the pics. How sweet, Molly! I hope your daughter has a wonderful time at homecoming. This is seriously the cutest thing ever! This is so very delightful I may smile all day! I heard that young folk are creatively asking for dates to dances this way, but, had not as yet heard how. I continue to be amazed at how the Harry Potter books have influenced our young readers, with pleasure I might add. How proud you must feel, Molly, and please post some pictures. OK I just got chills. That is so totally cool. Now you HAVE to take her to Universal this winter!!! Love it! And if they go dressed as Hermione and Ron at the Yule Ball, that would make for some wonderful pictures :-). Oh, that is so sweet. So good to hear romance is still going strong in this generation. That guy sounds like he might be a keeper … So cool. That is the coolest Homecoming invite I have ever seen….I'm so excited for your daughter! Oh, how sweet–wonderfully creative! I hope they have a fabulous time. It would be so cool if they went "in character." Yes, please do share pictures, if your daughter allows. This post has made me unbelievably happy! Oh I can't even tell you how much I loved this! Glad to hear romance is alive and well!!! That is by far the cutest and coolest asking out I have ever seen. I hope your daughter keeps that invite as a keepsake! With an invite like that, you know she is going to have a blast! Please share pictures if they do indeed go in costume! How sweet is he!?! Loved it! That is adorable! I'm impressed by this guy. I'm hoping for pictures! This is just so sweet!! I would love to see pictures. My daughter started her last year of high school today, too. This time next year, I'll have two away at university – but there's still the little one to be homeschooled, thank goodness! Molly–that is just so, so cute and creative. It is especially fun for me to read, as I am plowing my way through the Harry tomes at this time. I just finished #4 over the weekend and am not headed into #5. I only have until November to get caught up! Wow, oh wow, that is way cool! What a fun and creative way to be asked for Homecoming! How very sweet and creative too. I bet she is thrilled. Oh, what fun, and how creative the two of them must be! Enjoy! !